Darren Julien, president and chief executive of Julien's Auctions in Beverly Hills, said the jacket was bought by Milton Verret, a commodities trader from Austin, Texas. The jacket is one of two Jackson wore during the filming of the 1983 Thriller video. The singer wears the jacket in a scene with a troupe of zombies who rise from their graves and break into a dance routine. Mr Verret said the jacket would be sent on tour and used as a fund-raising tool for children's charities. 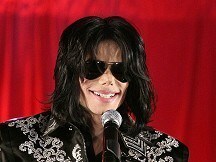 Jackson, 50, died on June 25 2009 as he prepared for a series of comeback concerts in London.